John Melo has 30 years of combined experience as an entrepreneur and thought leader in developing and growing technology companies and as a senior executive in the Oil & Gas industry. As President and Chief Executive Officer, Mr. Melo has led Amyris through successful technology development, industrial start up, product development and commercialization and a series of funding rounds, including the initial public offering. Before joining Amyris in 2007, Mr. Melo served in various senior executive positions at BP Plc (formerly British Petroleum) most recently as President of U.S. fuels operations where he successfully led a business transformation and significantly improved the financial performance. 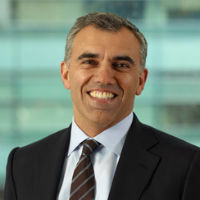 During his tenure at BP, Mr. Melo also served as Chief Information Officer of the refining and marketing segment; Senior Advisor for e-business strategy to Lord Browne, BP group chief executive; and Director of global brand development. In this last role, he helped develop the “Helios” re-branding effort. Before joining BP, Mr. Melo was with Ernst & Young. Mr. Melo currently serves on the board of directors of Renmatix Inc., serves on the board of directors of BayBio, serves on the Bio Industrial and Environmental section governing board, is a member of the Council for the Portuguese Diaspora and is a member of Young Presidents’ Organization (YPO). He was formerly an appointed member to the U.S. section of the U.S.-Brazil CEO Forum. When not working on the mission of making sustainable chemistry mainstream or championing the eradication of malaria, John enjoys skiing, reading and time with his family on the island of Pico in the Azores, his childhood home.